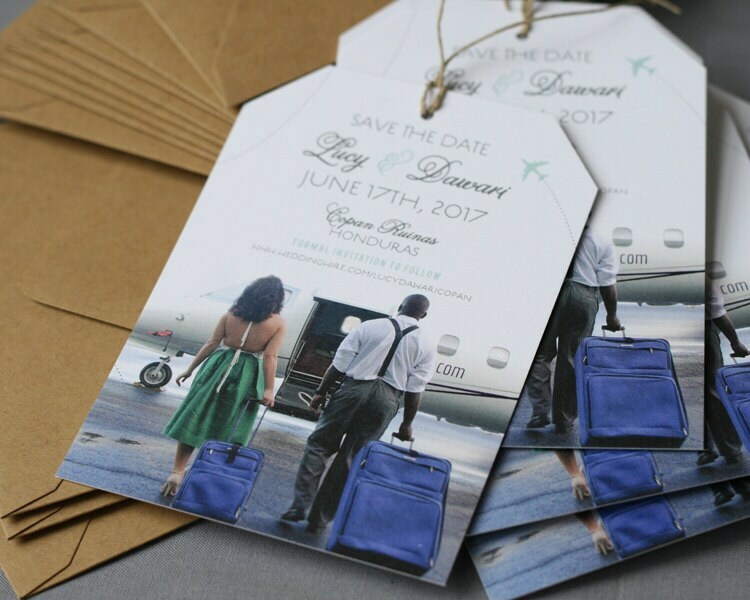 Our popular luggage tag Save the Date with magnet back, customized with a photo! Customize it with ANY DESTINATION and your choice of colors and wording! I will work to provide you with exactly what you hoped for. **Contact me via convo if you prefer not to have the twine and/or magnet back for a discounted price. Choose the quantity you'd like from the drop-down menu labeled QUANTITY & PRICING and check out. Printing a photo requires high resolution (300dpi) or higher. Professional photos are recommended. I cannot print any photo that does meet these requirements, sorry! After purchasing the listing, please send your photo via email to tara [at] deaandbean.com. To achieve the same look as the listing photo, a shot with a large amount of empty space works best. If the photo you send won't work for some reason, I will discuss options with you before proceeding. I will create a digital, customized PDF proof for your review with your color preferences and personalized wording. Once you have approved the proof, printing & finishing will begin. You'll receive a high-quality printed product on 110lb matte card stock with matching envelopes. Additional matching/coordinating items are available a la carte! Love this design but need something else? Sure! Any design can be customized for another purpose, just ask! Proofs will be emailed to you within 2 weeks (I'm super busy at the moment!) after you purchase. After reviewing your proofs, I'm happy to make 3 free revisions as you see fit. After that, additional fees may apply. Please check your proof carefully for spelling, punctuation, capitalization and/or grammar errors! If a sample is all you're after, they are available for purchase in a separate shop category labeled "Samples." Samples go out with the default colors and wording as you see in the listing. All personalizing happens after a full order is placed. Feel free to convo or email me anytime at tara[!at]deaandbean.com. I'm always happy to work with you! ***A digital file is NOT available for this design. The first set of cards that was sent to me had the bottom of the photo cut off. Although the seller did fix the problem quickly and send me a new set, I feel that it's something that should have been noticed by her ...rather than just hoping I wouldn't. Her excuse was that "it's not an exact science". Not very professional, in my opinion. Otherwise, the communication and quality are just so-so. I really love my save the dates except for a couple of things. One was the communication. I feel like responses could have been a little more prompt but I understand that she was really busy. Second, the quality of the save the dates is a tiny bit disappointing. The cuts at the top of the luggage tag are not even on both sides. And some of them have a small section of the letters cut off at the bottom. Nobody will probably notice but for having to wait 3 weeks to get them I am a little upset about these small details. Overall though I really do love them and she worked with me on customizing it to work with our photo.